A bridge is constructed by this volume between the separate professions and disciplines of international lawyers and social scientists. The authors attempt to restate international law, both its jurisprudence and its rules, in social science terms. 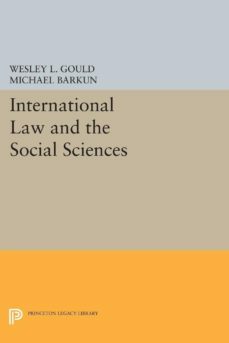 The authors then explicitly set forth the reciprocal relationships between international law and the findings, perspectives, and literature of the social sciences—showing how the insights and concepts of political science, sociology, psychology, and other disciplines can illuminate the field of international law. The limits as well as utility of social science materials in the comprehension, teaching, and practice of international law are evaluated.Originally published in 1970.The Princeton Legacy Library uses the latest print-on-demand technology to again make available previously out-of-print books from the distinguished backlist of Princeton University Press. These paperback editions preserve the original texts of these important books while presenting them in durable paperback editions. The goal of the Princeton Legacy Library is to vastly increase access to the rich scholarly heritage found in the thousands of books published by Princeton University Press since its founding in 1905.